This chapter combines evidence from Wilde’s lecture notes, newspaper interviews, and popular images dating from his 1882 American lecture tour. These sources provide an insight into his formative ideas on aesthetic design, ethical consumption, and education reform. Wilde’s aesthetic costume and public persona are discussed in relation to his role as promoter of Gilbert and Sullivan’s operetta, Patience. This created a need for Wilde to prove that he was an intellectual by publicizing his connection with Oxford and John Ruskin. Wilde’s aestheticism differed from Ruskin’s because it emphasized the pleasure associated with aesthetic consumption. 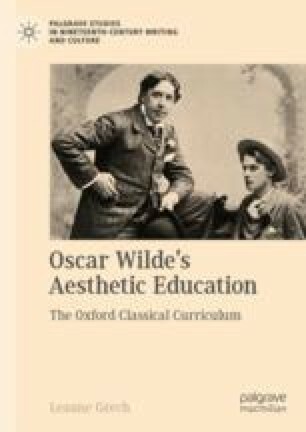 At this stage, Wilde also considered the moral benefits of including art and craft lessons in school and university curriculums. Sarony, Napoleon. ‘Number 16’. 1882. Photograph. Library of Congress. https://www.loc.gov/item/98519705/. Accessed 11 November 2017. Sarony, Napoleon. ‘Number 22’. 1882. Photograph. Library of Congress. https://www.loc.gov/item/98519699/. Accessed 11 November 2017.